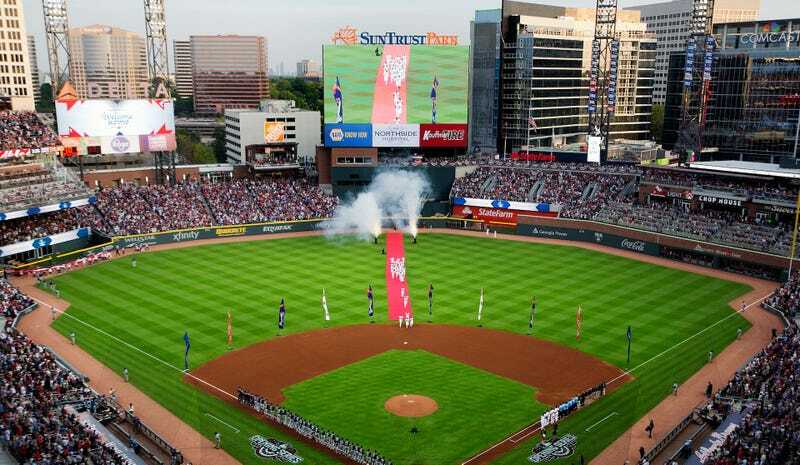 The Atlanta Braves began this season playing in a shiny new stadium located out in Cobb County. The new ballpark cost local taxpayers nearly $400 million, and at one point, the county was forced to raise taxes to pay for public parks because they’d overpaid so severely for the stadium, which is already seeing attendance start to decline, probably since the Braves are terrible. Those salary averages don’t include an already-approved pay increase, or any future wage increases over the next three decades, the life of the county’s contract with the Braves. The current estimated per-game cost is $11,066. Post-season games and concerts, like Billy Joel last month and Metallica in July, are extra and will cost the same. According to the report, the county did not budget for the increased toll of paying for the extra police presence, so they’ll have to take the money out of their general fund. Why would they fail to foresee this million-dollar drain on their budget? The agreement signed between the county and the team didn’t say anything about it. This mirrors a good deal of the process that led to the approval of the deal, as the public never got to vote on the stadium and dissenters were barred from speaking at a Cobb Commissioners meeting regarding the stadium. The “previous leadership” that Ott is referring to is former Cobb Chairman Tim Lee, who got voted out of office in July. While a few municipalities pay for the police officers who work before and after games, this sort of arrangement is relatively uncommon. Most teams pay for traffic control themselves. An AJC survey of 11 cities with professional sports stadiums found only two other instances where taxpayers funded all or a portion of traffic control. The survey included the Georgia Dome, where the state collected revenue from things like parking and food sales at the facility to offset that $1.7 million annual expense. Roger Noll, economics professor emeritus at Stanford University, said the AJC’s findings in the limited survey are valid across the NFL and Major League Baseball. The vast majority of teams reimburse municipalities for police, or cover the cost with rent payments, or just pay for it outright, he said. An extra $900,000 or more per year won’t break Cobb County, but it’s the sort of hidden cost endemic to publicly financed stadiums. The initial price tag tends to be a conservative estimate, and taxpayers usually get saddled with the extra costs. Taxpayers were supposed to pay $500 million for the Marlins’ stadium, but they’ll actually pay over $1 billion. Nationals Park cost the city of Washington D.C. more than the $700 million it was supposed to. Meanwhile, Oakland taxpayers will soon owe $163 million on the Raiders and Warriors’ stadiums after both teams have left the city. Yet another reason why billionaires should build their own stadiums.